We have built a bespoke current and wave tank for the Stony Brook University, New York State. The tank can be seen in action on our Youtube page. The tank features our first production Wet Back Piston Wavemaker. The machine is 25m long, 1.5m wide x 1.5m deep and is designed to operate in depths up to 1m. The tank has glass sides to allow observation of experiments and stainless steel base trays. 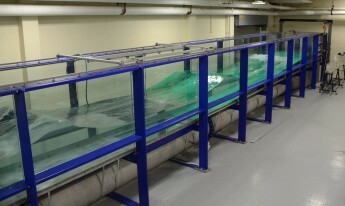 The tank will be used for a wide variety of coastal engineering experiments. This entry was posted on April 13, 2017 by Ian.